The Colac Quilters, based in the Victorian city of Colac, 150km south-west of Melbourne, held their biennial exhibition earlier last year. It was a special occasion as the group was celebrating its 30th anniversary. The theme was ‘A Day in the Country’ and a number of vignettes featuring old vehicles and props set up as if for a country picnic were assembled to enhance the theme. Eighty quilts, ranging from cot to king size, were on display, showcasing a variety of quiltmaking techniques. Members also made two quilts and an embroidered tablecloth to raffle, with the proceeds donated to Blaze Aid, a group that assists in rebuilding fences on farms affected by bushfires, and to purchase fodder for the bushfire-affected farms in Cobden and Terang. 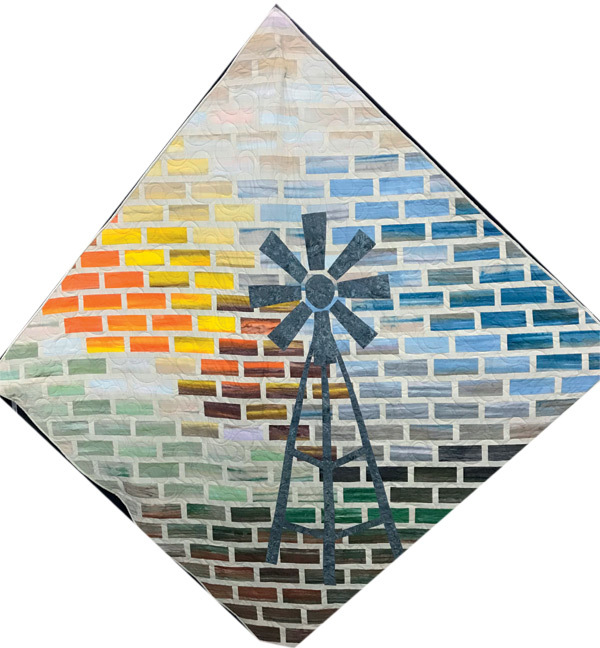 Simone Hayes created an original design in response to the ‘A Day in the Country’ theme, with her quilt depicting a windmill on a background of outback colours. 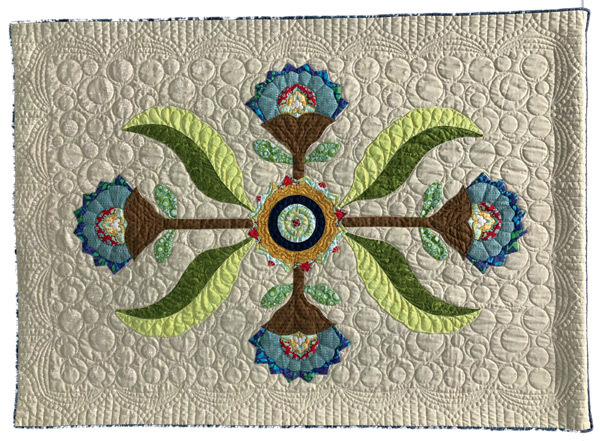 Kim Mahoney was inspired to make her appliquéd wallhanging by an antique quilt made for a baby. 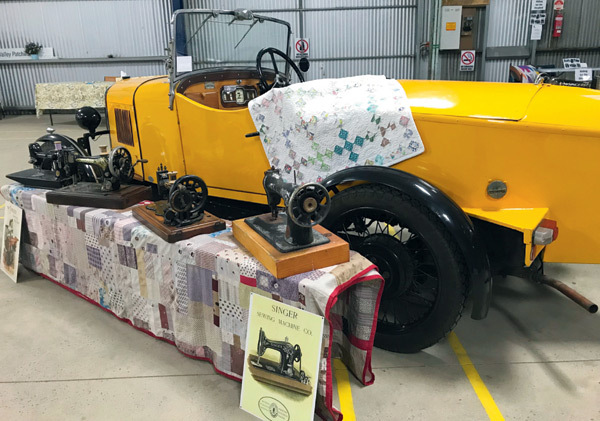 A vintage car served as the backdrop for a display of old Singer sewing machines and several quilts at the Colac Quilters’ 2018 exhibition. An unusual exhibition of quilts is currently touring New Zealand before heading to Europe later in the year. It was organised by the Nihon Heritage Quilters’ Guild of Japan, who invited members of the Aotearoa Quilters and a group based in France to make a quilt based on some of the most spectacular wonders of the natural world. Each participant was given a different natural wonder to feature in their work, with a counterpart in Japan and France working on the same topic, creating an exhibition that provides three different responses to the same phenomenon. There are three sites — one each in Japan, New Zealand and France, with the remainder located elsewhere around the world. 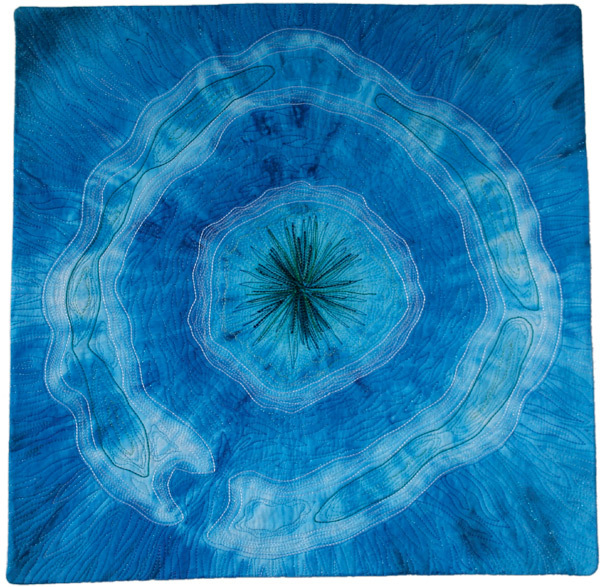 Helen Beaven’s quilt was made to celebrate Bora Bora, perhaps best known these days as a tourist resort in the Pacific Ocean. The main island has an extinct volcano rising to two peaks, and is surrounded by a lagoon and reef. Helen started her project by painting white silk with a simplified tie-dye technique using clothes pegs. She quilted the project with metallic, holographic and perle threads. 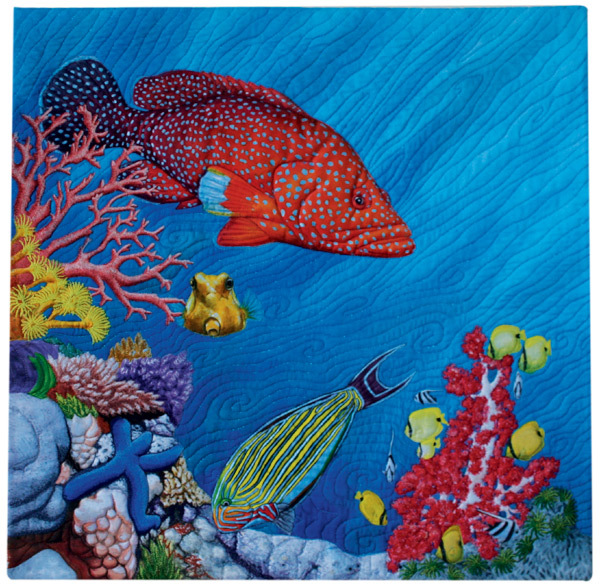 The Great Barrier Reef was the focus for Sonya Prchal’s quilt. Her techniques included painting, thread sketching and free-motion machine quilting. 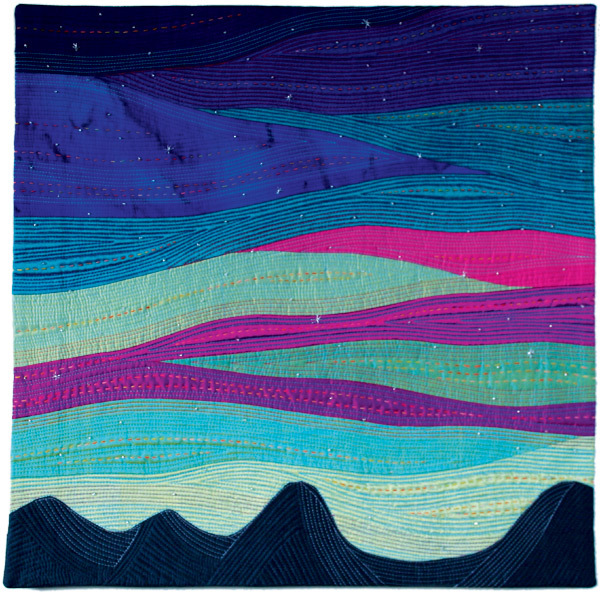 The Aurora Borealis – the Northern Lights – was the natural wonder that Shirley Sparks commemorated in her quilt. The 2018 Scottish Quilting Championships were held as part of a joint event with the Creative Craft Show in Glasgow this year. Sixty-two quilts were judged in five categories – Traditional, Contemporary, Art, Group (two or more makers) and Theme, which this year was ‘Mackintosh Risen from The Ashes’, to coincide with the 150th anniversary of the birth of Charles Rennie Mackintosh. 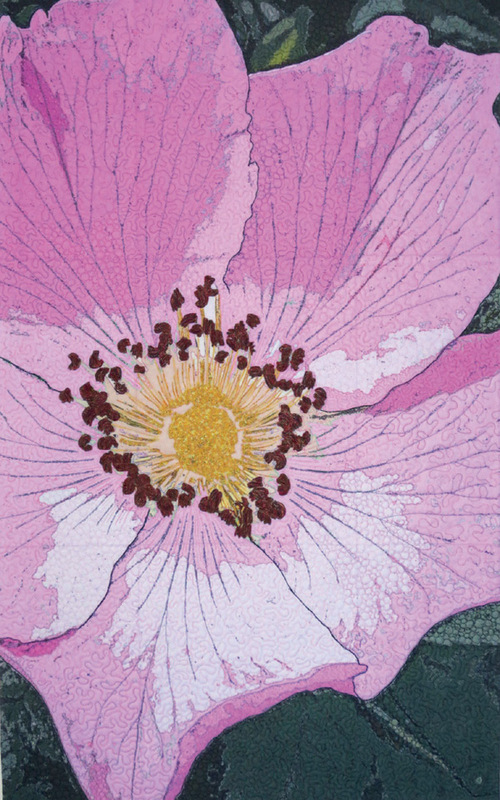 Jennifer Welsby took our silver in the Art Quilt category at the 2018 Scottish Quilting Championships for Kenmore Rose. She transferred a digitally manipulated photograph onto cotton fabric, then machine pieced, embroidered and quilted it.